The 90s began without much awareness of the Internet. The Internet was an elusive entity known only to the military, university researchers, and uber-geeks. By the end of the 1990s the Internet was proliferating itself everywhere. Most people my age were just finishing up high school. The closest thing I had to an Internet was my Apple ][e and local bulletin boards. And my 9600 baud modem was considered fast! We played a lot of Zork and Hitchhiker’s Guide to the Galaxy from 5.25 inch floppy discs that made a lot of crunching noises inside the drive. I had a shirt that read “Don’t overload your computer, you might slip a disk!” Wow. What’s this e-mail thing? At the university I attended there were rumours you could talk to your friends via electronic correspondence. I had to convince my speech professor that I needed an e-mail address for research. I actually had to get a signature to get a shell account (which I still have, btw). E-mail and telnet access to the university servers opened up a whole new world. Not only did I discover the dingiest and dankest basements filled with dumb terminals, I found MUDs where I could meet up with colleagues at the virtual pub, even when they were physically sitting right beside me. And when the basement computer labs were full I could always find a computer in the library with Gopher, whose infinite subdirectories yielded telnet links to the university servers if you were willing to dig deep enough. It was during these years I also got my first PC with a 14.4 baud modem, and shelled out $100 for 4 megabytes of RAM. Local ISPs began to offer dialup service. The local bulletin board was replaced by IRC while modem speed increased to 28.8 baud. And a basic SLIP/PPP connection could be set up to browse the web. Netscape Navigator was about to be unveiled, so in the meantime we used a browser called SlipKnot. I built my first web page for a local surf club. After Y2K exited with nothing more than a whimper the world again focused it’s attention on the Internet. Maverick venture capitalists were still fueling the dot-com craze completely unaware of the roller coaster ride ahead. Nearing the end of the ride the new decade finds us more cautious but still willing to try out new ideas. Although it was still early, web-based applications began to appear online. 37signals put themselves on the map with the eNormicom web site and quickly followed that up with Basecamp, a web-based project management application. The MVC framework peeked its head out from behind Ruby on Rails. It was in 2006 that Pelago built Intervals, a first-of-its-kind web-based project management application that combined time tracking and task management with a simplified approach to project management. Although many PHP frameworks were available and were evolving quite nicely, we decided to built our own lightweight MVC framework, called Archipelago, to handle the bare necessities that our web-based software would need to run efficiently. The term Ajax was coined and those web developers on the bleeding edge at Google began implementing it into Gmail and Google Maps. Meanwhile, broadband became the norm while web sites began to push the limits of streaming audio and video. Firefox came on the scene and was a substantial threat to Internet Explorer. The last three years are a punctuated collective of discontinuous flurries, that while partly to blame for the further reduction of the average attention span, have also introduced an entirely new vocabulary to popular culture. We google memes while we LOL. Viral videos are far more infectious than any real disease. And social media is here to stay, allowing us to facebook one another and tweet our random ramblings to whomever may be listening. The lightweight MVC framework has fully matured, becoming available for all web-based programming languages and allowing developers to churn out applications with incredible ease. As a result, new web-based apps are appearing on the scene weekly covering every business need from simple co-worker communications to complex business management processes. On the browser front Firefox has gained a strong foothold in the market due to its speed, reliability and custom add-ons. Both Firefox and Internet Explorer have been taken full advantage of by web-based application developers using Ajax to keep their interfaces persistent and more desktop-like in their usability. As the online marketplace becomes more crowded SEO is going to be the quickest and easiest way to differentiate companies in search results. It takes a long time to create genuine content that results in high organic rankings, so instead businesses will be utilizing more PPC methods to drive traffic to their site. However, Google always has and always will place a premium on content so new businesses will also have to focus on keeping their web sites intriguing, indexable and up-to-date. The lightweight framework has resulted in a lot of new web-based applications. Mainly because it is so easy to throw an app together and toss it online to see if it sticks. However, there is a lot more to offering a web-based application than just building it. In this new decade we’ll see the marketplace drown out smaller offerings as businesses evolve and crave more comprehensive online software. We’ll also see marketing play an important role in determining which applications stay online. Web-based applications will have to be continuously optimized to keep up with the demand for more desktop-like applications with fewer page reloads and less wait times. Despite all this talk about computing in the cloud there are still a lot of small businesses hesitant to trust their data to an online application. This adoption barrier is waning and will continue to in the next few years until the cloud becomes as common as the desktop computer. Along with this influx of online customers will come a greater responsibility for Software as a Service companies. Data integrity, backups, and the ability to restore from a backup in the event of an outage will become most important. Businesses using the cloud will become less patient with even the shortest outages. Geo-redundancy will become essential for any Software as a Service provider hoping to grow its customer base. The browser war will continue much like it has. Firefox will usurp Internet Explorer just like the latter did to Netscape Navigator. Once Firefox assumes the throne it will likely become weighed down with too many features (this is already happening) and a faster browser will take its place. Most likely that will be Google Chrome. 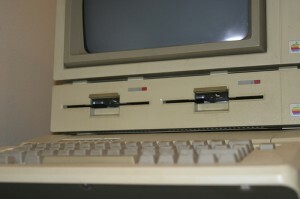 I’m sure I’ve left something out, like the fact that my first computer was actually a TRS 80 that used cassette tapes to store data. Fill in the timeline. Let me know what is missing and what you think is yet to come.